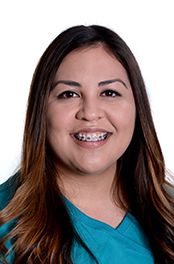 Misty Camacho is a registered dental hygienist at La Clinica’s East Medford Dental Clinic and Central Point Health Center. She holds an associate degree in applied science from Carrington College in Portland and worked at Willamette Dental in Medford before joining La Clinica’s staff. Misty is a Medford native who returned to her hometown after college and enjoys serving the community.